These are the words which a Turkish director Göksel Gülensoy wrote, not for a woman, but for the most brilliant monument of Byzantium - the Hagia Sophia of Constantinople. The legends and theories about Hagia Sophia drove Gülensoy to become involved with the monument. “I desired to see the things which were hidden, not the things above the earth which everyone sees, but to see those things which are below and are yet to be discovered. I wanted if possible to learn whether the legends and theories which I read in the books are true regarding Hagia Sophia’s underground. I began very slowly to “discover” the monument and the fruit of this effort was my first documentary Hagia Sophia which had as its theme the monument itself and the legends associated with it. My work had as much an effect in Turkey as it did to those on the outside, and the recognition of my love was my award that I received," he said in an interview with ANA-MPA. This same film was awarded in 1994 with the second award for Best Documentary at the Ankara Film Festival and in 1995 with the Best Documentary Award at the Tampere Film Festival. It was also honored with an Honorable Mention at the San Sebastian Film Festival in 1996. “But my passionate love for Hagia Sophia was born in 1998. I knew that it would be a relationship that would last many years. First, it was necessary for me to see it with my own eyes, to come to recognize it and most significantly to discover it. And this is what I did. 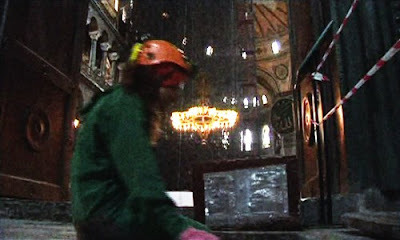 In 2000 I finished my second documentary with the title Hagia Sophia and the Cisterns. The cisterns are underground structures which were used in more ancient times for storing water. With the passage of time my love was being transformed into a passion which has overtaken me now for eleven years” added Gülensoy. Beginning with the theories which sought to link Hagia Sophia’s underground structures with the neighboring Royal Cisterns and with the complex of the Great Palace, the Hippodrome, and even with the Princes' Islands, the Turkish director wished to explore the “depths” of the monument. “I made a new start. But this time it was necessary to delve into the “depths”, to learn and to bring these things to the surface about which knowledge was lacking. 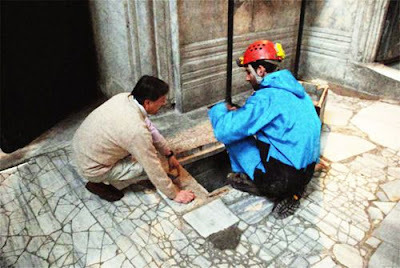 The floor of the main church is mainly tiles, half of which covered the cisterns and the other half tunnels of water. I received a permit from the Ministry of Culture and I started the exploration to see what is in these tunnels under the tiles. I confirmed that the church did not connect with either the Royal Cisterns or with the Great Palace, nor with the Princes' Islands. In the writings of a Russian pilgrim from the Thirteenth Century I had read that in the courtyard of Hagia Sophia Saint Antigonos was buried, who was a youth. Within the tunnels a skeleton of a child was found which possibly belongs to this Saint. However, it is necessary for the archaeologists and other specialists to investigate. They also located in "rooms" in which there were buried priests. In the cisterns canteens were found which dated to 1917 and possibly belonged to British soldiers who maybe were attempting to acquire some holy water. I encountered such beauties they blinded me. I saw things which even kings did not see; I heard the voice of history and became its witness. I was not able to be arrogant before such beauty. I desired to share it with everyone who also marvels at Hagia Sophia. I wanted everyone to see its unfamiliar aspects which are hidden below the earth. For this reason I rushed to document everything I saw with cameras," Gülensoy continued. All the fruit of this search will become his third documentary that is dedicated to the monument and is titled In the Depths of Hagia Sophia. The documentary has as its assistors and advisors professors of Byzantine archeology from the University of Constantinople, İhsan Tunay and Haluk Çetinkaya. "Eleven years of work was needed for this documentary to come into existence, which now is in the editing phase and requires about 40,000 euros for completion. There are no sponsors and there is no financing coming from any source. At this moments I have at my disposal 65,000 euros for things pertaining to the film and it was necessary to work outside of Turkey to collect this amount. I know that when the work is completed many will envy me, because I saw unknown aspects of the monument. So be it, let them envy me. Hagia Sophia will always be my great love and I will do other documentaries about it. My next project I will do a documentary about the Christian priests buried at Hagia Sophia” concluded the Turkish director.